In his role as emcee of all things geeky, former Mythbuster/current Tested host Adam Savage released a new video of his visit to the props department of the upcoming Ghost In The Shell live action adaptation. The film’s impressive props were created by Weta Workshop, the New Zealand company famous for its work on the Lord Of The Rings franchise. 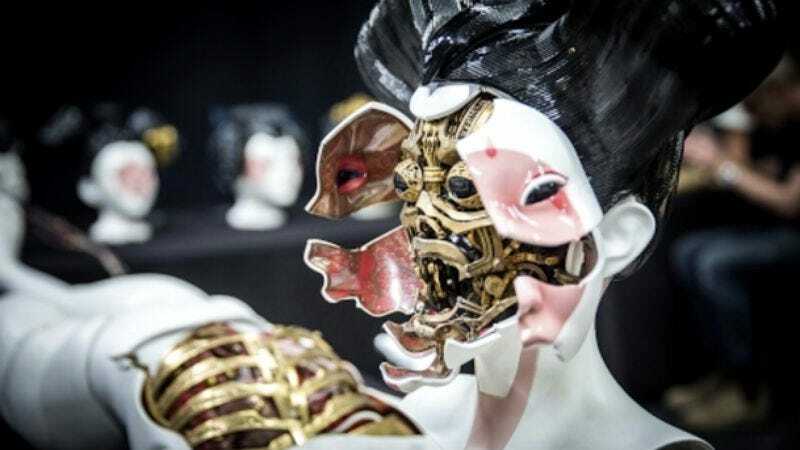 And Weta founder/creative director Richard Taylor is on hand to talk Savage through the creation of the film’s robotic geishas, which were featured in the most recent trailer. What comes through most clearly during the tour is just how much attention Weta pays to detail. That includes both the aesthetics of the designs as well as their functionality. For instance, the rigid, robotic geisha masks were designed to be as comfortable as possible for the actors wearing them. They can be taken off easily so the actors can relax between takes, and they even have tiny fans inside that keep the actors cool during filming. A former propmaker himself, Savage is basically beside himself throughout the whole tour. He digs into specific design choices, including Weta’s desire to create a “future tech” aesthetic that doesn’t just look like a stereotypical futuristic world. And he celebrates the fact that, from magnetic attachments to pull string closures, Weta marries form and function in a really impressive way.